Intersection worked with a team of leading education, design, gaming and media firms to create the Edward M. Kennedy Institute, a new interactive museum located in Boston, Massachusetts. The Institute immerses students and patrons in the U.S. Senate’s mission, history, and work through digital touch points, thoughtful user experience design, and a unique overall approach. We led technical design and development, creating a platform of exhibit and tablet-based applications that enable interactivity between facilitators, visitors and digital content. EMKI redefines the traditional museum landscape of guided tours and self-education, and introduces a new way for patrons to learn, through participation. 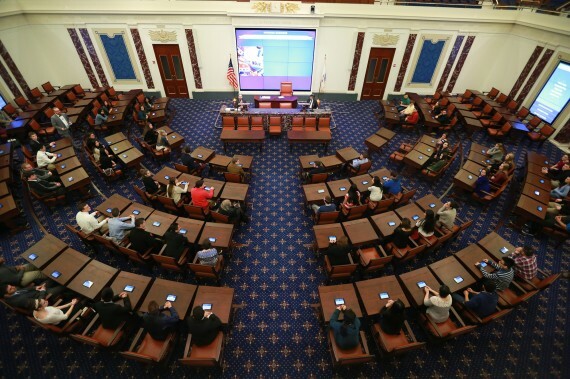 In a full-scale reproduction of a U.S. Senate Chamber, up to 100 visitors can interact as Senators by debating, negotiating, and voting on real legislation, all powered by technology. As people enter the chamber, they are handed a tablet that has been customized, which guides them through the voting sessions. The simulated “game” then begins, where visitors and students are engaged to participate with each other, sometimes meeting for the first time. The user experience design was conceptualized to cater to the multitude of audiences who vary in levels of familiarity with technology, making the simulation personable, useful, and entertaining. More than anything, technology was viewed as an enabler in this project, not an added feature. The digital touchpoints within the voting session were designed to facilitate participation amongst the group and encourage people to learn about the U.S. Senate through experiencing it as a Senator. We built an open platform and an extensible CMS so that external contributors can create new simulations to keep the content topical. We also created a toolkit that allows schools around the country to conduct versions of the simulations in their own classrooms with little infrastructure overhead. The result is an immersive educational experience that showcases the value of group interaction and dynamic learning. Linking both historical traditions along with relevant issues hitting the Senate floor today, the Edward M. Kennedy Institute emphasizes a communal learning experience by facilitating a community out of random individuals. It also reflects the ethos of Institute: that collaboration is necessary to achieve the greater good, inside and outside of the Senate walls.